KAMPALA – Supreme Court has finally fixed April 18 as the judgment day for the long-awaited presidential age limit appeal that is seeking to quash the judgment of the Constitutional Court that upheld the amendment of the Constitution to scrap the presidential age limit clauses 102(b). A seven-judge panel led by Chief Justice Bart Katureebe is expected to deliver their judgment this week. Other justices include Jotham Tumwesigye, Paul Mugamba, Opio Aweri, Richard Buteera, Stellah Arach Amoko and Lillian Tibatemwa. “Take notice that the judgement of this appeal has been fixed for the 18th day of April 2019 at 10:00 am. If no appearance is made by yourself, your pleader or by someone by law authorized to act for you, the judgement will be delivered in your absence,” reads the notice in part as signed by the Deputy Registrar of the court, Mr. Godfrey Opifeni. On July 26, last year, the Constitutional Court sitting in Mbale District, in a majority decision of 4:1, upheld the scrapping of the presidential age limit clauses from the Constitution by Parliament. However, in a unanimous decision, the same court struck down the extension of the term of the current Parliament and local councils by two years. The appellants who include Uganda Law Society, six Opposition MPs and lawyer Male Mabirizi went to the Supreme Court to quash the Constitutional Court decision and have the presidential age limit clause of 102(b) reinstated in the Constitution. Before the amendment of the Constitution by 317 MPs, President Museveni would not be eligible for re-election in 2021 on account of being aged above 75 but he is now eligible to contest if he wishes since the barriers were done away with by Parliament last year. 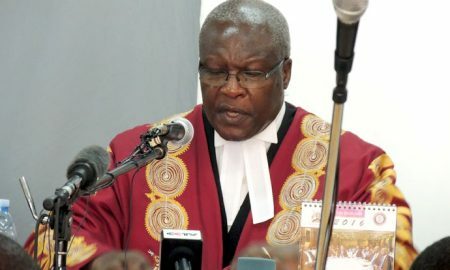 The court is to decide on among the agreed issues, whether the four constructional court justices who were part of the panel that heard the petition at Mbale committed procedural errors, whether they erred in law and fact to hold that the removal of the presidential and LCV officials age -limit was not inconsistent with the constitution. Others are whether the justices erred in law and fact to hold that the entire process of conceptualizing, debating and enactment of the age-limit law did not contravene the constitution and whether or not the presence of violence in and outside Parliament during the debating of the Age -limit bill did not contravene the constitution.